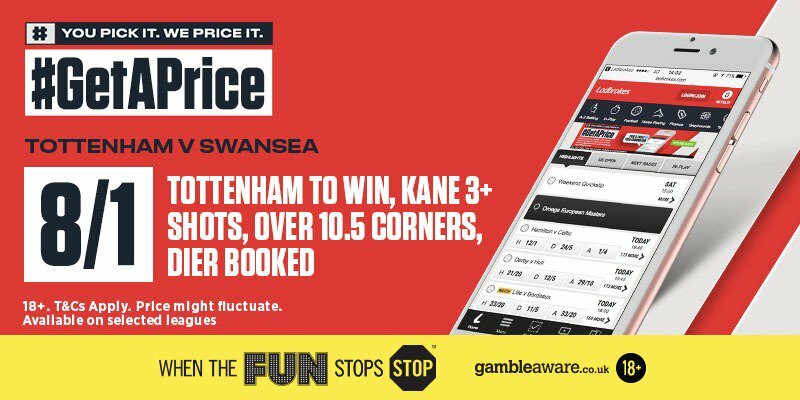 Given the “exponential growth” in demand for same game accas, Ladbrokes have launched a new feature called #GetAPrice. Request your own odds for almost any outcome you can think of and Ladbrokes will give you the price for that bet..instantly! There is nothing quite like having total power to be able to pick and combine options in a bet the way that you want them. 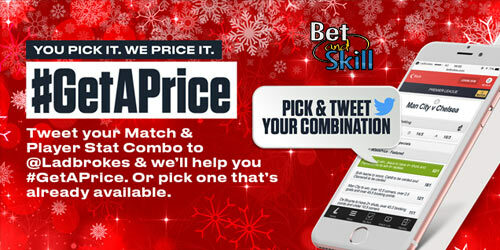 #GetAPrice gives you the power to pick and combine your own Match and Player Stats markets. It allows you to request a price on a number of Football markets by tweeting @Ladbrokes with #GetAPrice and if a #GetAPrice market doesn’t already exist, Ladbrokes will try and create one for you. The bet can be made up of anything like shots on target in a game, to assists, to tackles, shots, passes and a whole host more stats-based options. Being honest bookies have always given you prices on request, the difference now is you can ask for odds almost instantly (allowing you to request odds in play for example) and also share those new markets with other customers on the site. 1. 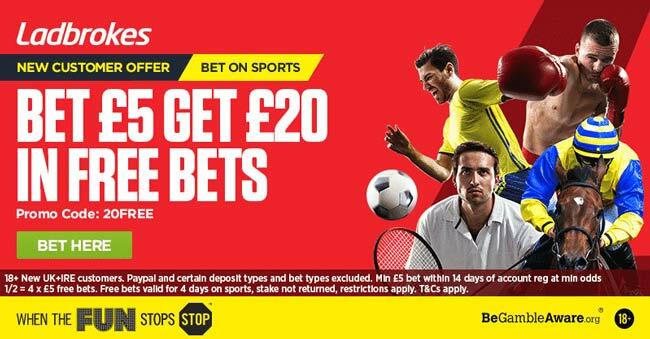 Register a new Ladbrokes account or login to your existing one. 2. Pick your bet – from a whole host of stats. Like assists, passes, shots, shots on target and tackles, or any combination. 3. 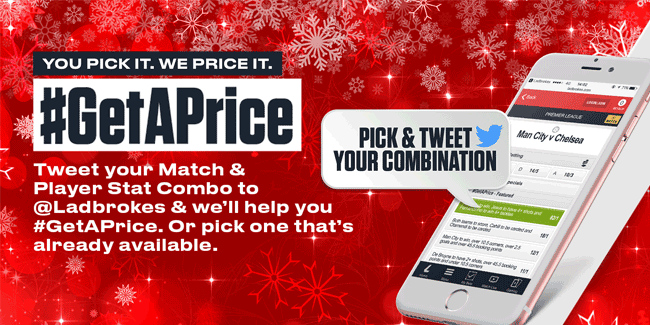 Tweet your combination to @Ladbrokes with #GetAPrice. 4. Ladbrokes will send you a price and link to place your bet. #GetAprice is available every week on all Premier League, La Liga, Serie A and Champions League matches. Prices are subject to fluctuation. #GetAPrice bets cannot be combined with any other bets. 1. WHAT HAPPENS IF ONE OF MY PLAYERS DOES NOT PARTICIPATE? In the event that one or more of the players in any bet does not participate, the bet will be voided and your stake will be returned. 2. WHAT HAPPENS IF ONE OF MY FOOTBALL PLAYERS DOES NOT START? In the event that one or more of the players in any single, combined or head to head bet does not start, the bet will be voided. 3. WHAT HAPPENS IF THE GAME IS CANCELLED OR IS POSTPONED AND DOES NOT RESUME THE SAME DAY? The bet will be voided and your stake will be returned. 4. IS EXTRA TIME INCLUDED? 5. FOR OVER/UNDER BETS, WHAT HAPPENS WHEN PLAYER'S FINAL SCORE EQUALS THEIR SET LINE? The bet is marked as a "push" and wager will be refunded to the customer. 6. WHERE DOES THE DATA COME FROM? All of our Football statistics come from Opta. 7. WHAT DECIDES SETTLEMENT RULES? Opta will be used as the primary source of data for settlement of #GetAPrice markets. 8. WHEN WILL BETS BE RESULTED? Within 30 minutes from the conclusion of each match. 9. WHAT HAPPENS IF A BET LEG WITHIN A #GetAPrice ACCUMULATOR IS VOIDED? If any bet leg within an Accumulator is voided then entire bet is voided irrespective of the results of the other legs in that accumulator bet. 10. You must be aged 18 years or over to bet and participate in #GetAPrice. 11. The Promoter reserves the right to suspend, cancel or modify #GetAPrice at any time (and for any reason) without prior notice. 12. Ladbrokes reserves the right to restrict bonuses to individual customers at its discretion.